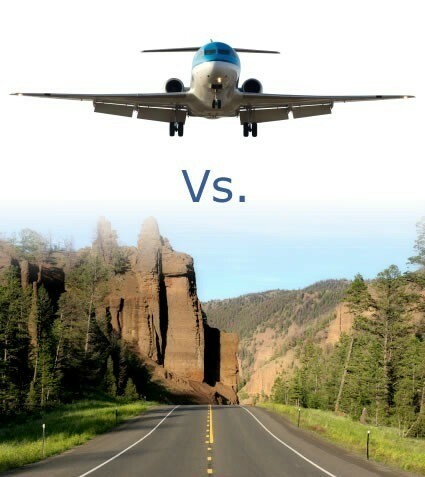 Sometimes when planning a trip you might want to compare and contrast between driving or flying to your destination. This is a guide about driving vs. flying. I am traveling alone, I am 55 years old and I drive a 1997 Mercury Grand Marquis with 104,000+ miles on it. It runs well, no oil leaks, etc. By car, the trip will take 11 hours one way and by plane it will take a little over 2 hours. My cost for fuel excluding the $4 toll will be $117 one way. If I stay at a Motel 6 they have free parking and the room per nite is $89.99. If I rent an economy sized car it'll cost $197.86 plus unlimited mileage, and $150 deposit fee. Now, if I fly it'll cost around $300 for the airline ticket, a carry on bag, and a backpack. I would stay at the Westin (a lot nicer hotel) downtown with a discount bringing the rate from around $125 down to $104. I can catch the subway from the airport to the hotel for about $2. If I drive and park at the Westin it'll cost me $22 per nite. If I don't drive I can ride the subway system to any place I desire to go or walk since most attractions are within walking distance. The subway offers a $19 unlimited ride pass for four days. If I buy any items that require they be checked in at the airport I could mail them via USPS to my home and save the fee at the airport. Or if I drive, I can just bring them back in the car with me. Now one more thing, my cousins advised me that if I drive my car to Atlanta (which they recommend I do) and something happens a long the way they are willing to drive the 11 hours to pick me up if need be. I have had people tell me to drive and some say to fly. My physician even told me to fly, get there early and have more time to sightsee, etc. and even get a nicer hotel (Westin) to stay in for about $20 more. What do you advise? Thanks. I would fly if I was you! If you have car trouble how and what will it cost to get your car home? Plus it will keep those extra miles off your car. You will also have more time there! To me that is one less thing to worry about. I'm traveling 800 miles for the Christmas holiday and I'm trying to decide if I should fly or drive. The flight is about 2 hours, the drive would be about 14. I'm on the fence because I don't know which way is safer and the most practical. We'll have a lot of luggage not only for us but the baby. She will be 6 weeks old. What should I do? I personally don't like to fly. I am a large person, and I am so uncomfortable squashed up in the seats and there is just no leg room. I recently drove from Texas to California to see my family, it is over 700 miles each way. Yes, the drive is long, but to me it is worth it. I can bring anything I want for my kids, and I have the advantage of having my own car if I want to get away from everyone for awhile. I hope you have a good trip, whatever you decide. Hi Stephanie, I'm also traveling for Christmas this year. I'm driving 970 miles by myself. I've checked flights, and it's cheaper for me to drive than to fly. You have to consider the amount of luggage you'll be taking, plus gifts. My car will be packed, but it would cost me extra to fly everything that I'm taking with me. It's really a matter of choice and cost. If you can afford to fly, then I would go that way. But I can't afford it, so that's why I'm driving. I also do most of my driving at night because there is less traffic on the road so it's safer. Whatever you decide, have a Merry Christmas and a safe New Year! If it were me, I'd fly. A 14 hour road trip with a baby that has to be fed, diapered, etc. means frequent stops (can't do those things while she's buckled in a car seat!) and can easily turn into much longer than that. Safest? Well...the chances of somehting happening in 2 hours vs. 14+....I'd say the shortest time would have the better odds. You might not fly often enough to remember how painful it is on the ears sometimes. The last flight I took was to Amsterdam and took 9 hours. The whole flight was upset over an infant screaming most of the time. Poor thing its mom was crying almost as hard. Enjoy the drive I say. With a very young baby, I would really consider not traveling by plane, because she will be exposed to so many viruses. When my son was young, we made several trips that were over 1000 miles, and we always drove. Forget all the horror stories you hear, he was good as gold, slept a lot. When he was up, I often sat next to him while my husband drove, to read books or play with him. I'd buy a few new small toys to keep him occupied as he got older, but as an infant, he slept on the trips. One tip I'd give, is to make sure someone can watch her when you arrive, cause she'll be wide awake and you'll be ready for a nap. Don't let anyone fool you, flying with a baby can be a major problem. It's hard to carry everything you need with you, it's not as easy to deal with feedings and diapers on a plane, other passengers quickly get annoyed and angry, and to be safe, you must buy another ticket for a seat to strap the baby-seat into. Do not attempt to hold your infant on the trip. I've seen planes hit turbulence and babies go flying out of their parent's arms, several rows up the aisles, only to land and get hurt. And you must remember all the time you'll spend waiting in the terminal before and for bags after the flight. Either way, making a trip with an infant can be stressful. Hope all goes well for you. I say drive, too. As the grandmother of 9, 5, and 1 year old girls I know the amount of "stuff" required to travel with a baby. There is no way in the world I would attempt to fly with a 6 week old...for all the reasons already listed, plus weather delays in an airport with an infant. At least if you are driving and run into bad weather, you can get a motel room until things clear up if need be. Whatever YOU choose...be safe and have a Blessed CHRISTmas!! !